Craving some comfort food? Look no further — these cheese and veggie lasagna roll-ups with spicy marinara sauce are just the ticket. With summer almost upon us, this is a great way to use zucchini or squash, which will be abundant and cheap in the next month. 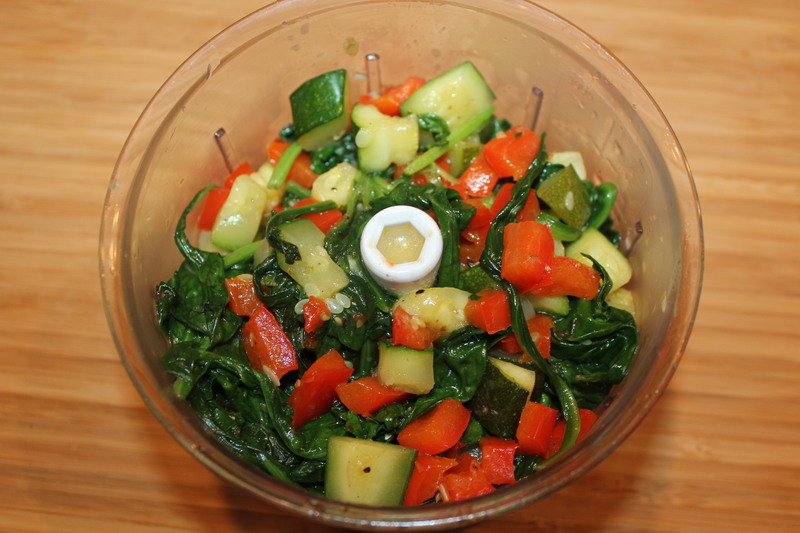 I added some spinach and sweet red bell pepper, but choose the veggies you like. Or, add some baby bella mushrooms — the possibilities are numerous. I make my own marinara sauce with canned tomatoes, red wine, onions, celery, garlic and Italian spices, etc. However, feel free to use your favorite bottled brand, especially if you’re in a time crunch. 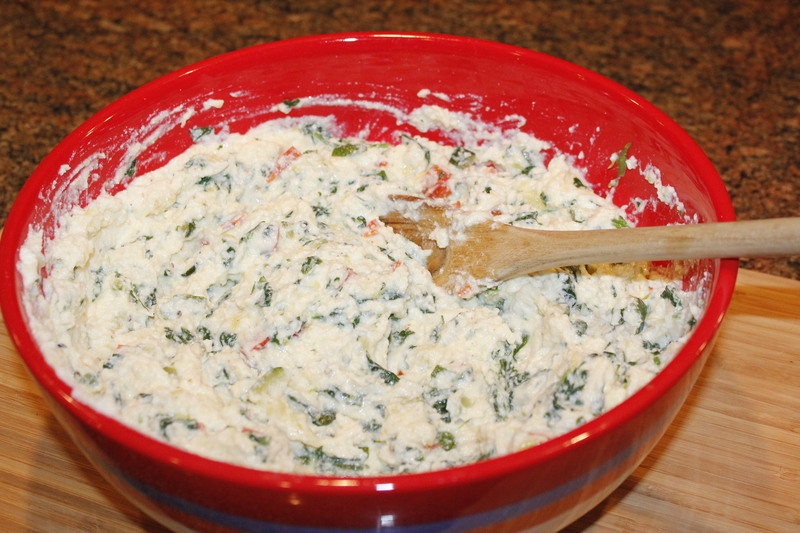 And as far as the cheese, use part-skim ricotta and reduced-fat mozzarella — you will never miss the fat! I added parmesan because a small amount adds a ton of taste, and asiago since that’s what I had in the fridge. You can easily substitute the asiago for Gruyère or other favorite cheese. Just add lots —that’s what makes this so comforting and fabulous! 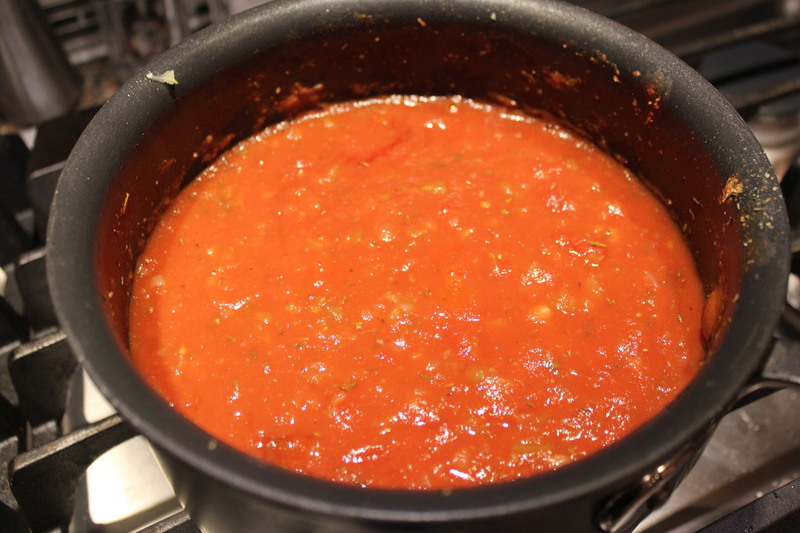 Prepare marinara sauce, keep warm. Heat olive oil in a large skillet. 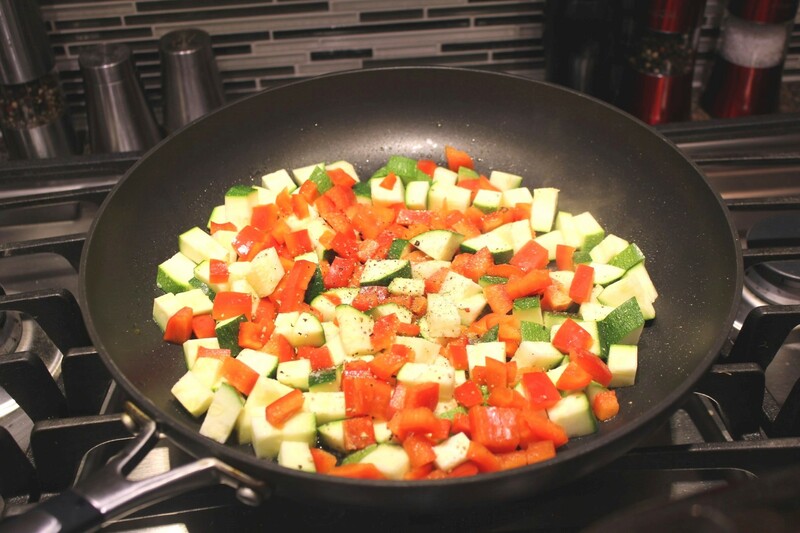 Add zucchini and red pepper, season with salt and pepper, and sauté until just tender. 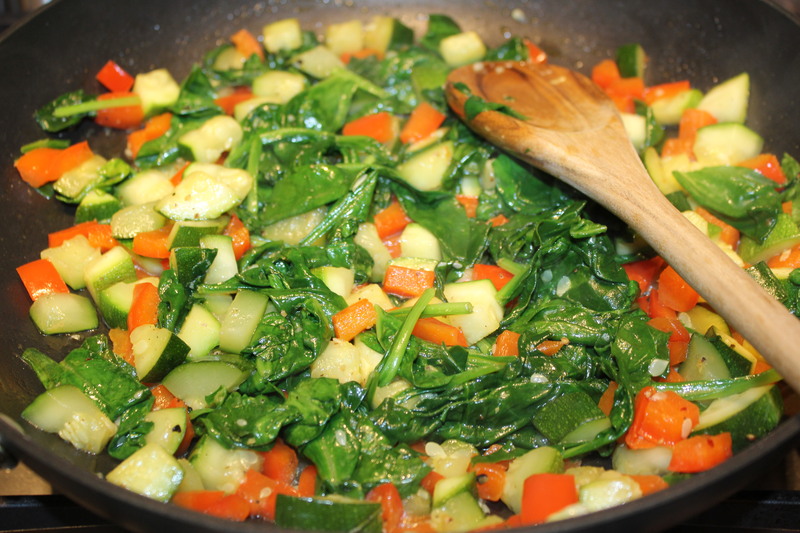 Add the spinach, and cook until it wilts. Remove the veggies from the heat, let cool, and then coarsely chop in a food processor. Bring a large pot of salted water to boiling. 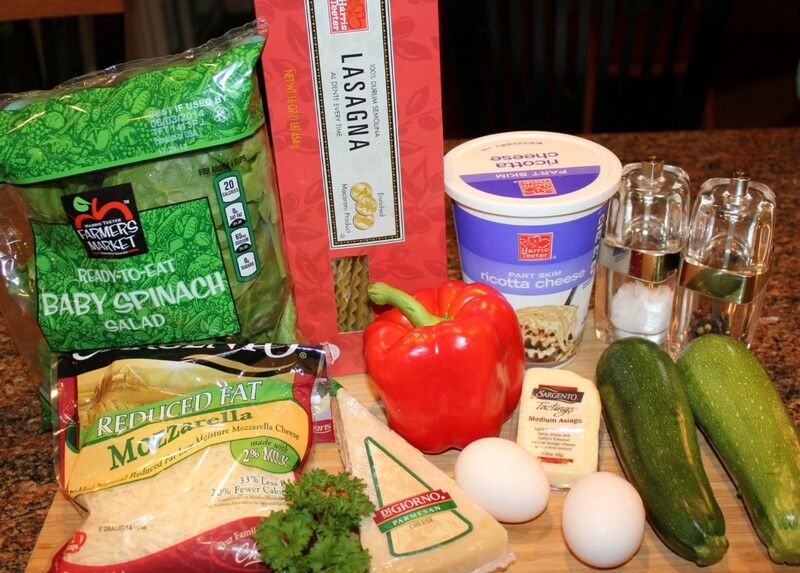 Add lasagna noodles and cook until al dente (follow cooking directions on box.) 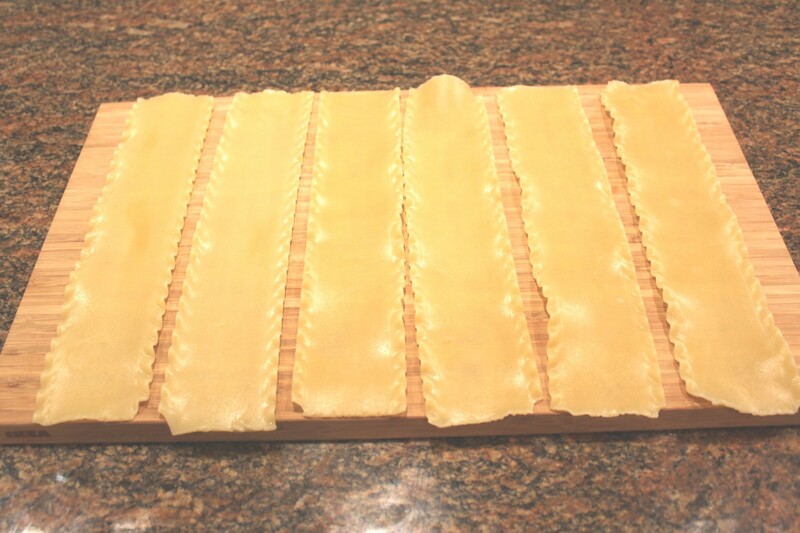 Drain noodles on paper towels, let cool and transfer to a cutting board. 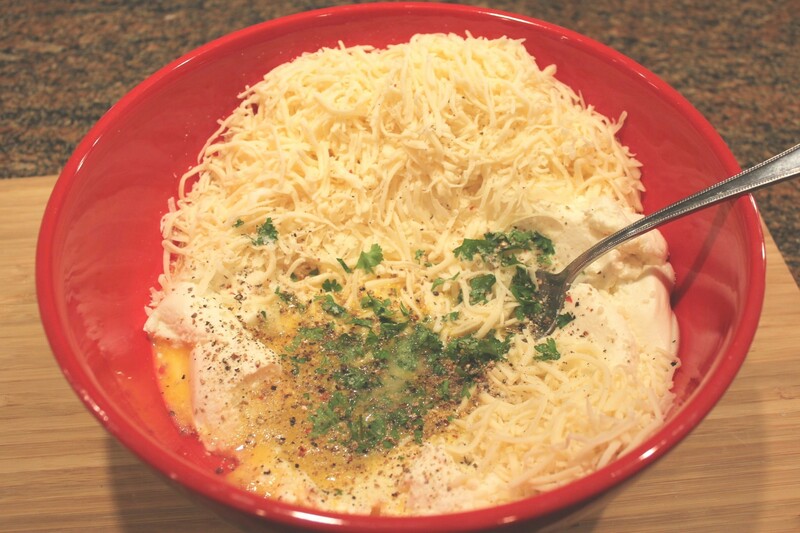 While the lasagna noodles are cooking, mix the four cheeses, eggs, parsley, salt and pepper in a large bowl until blended. Add the veggies to the cheese mixture. Refrigerate until ready to use. 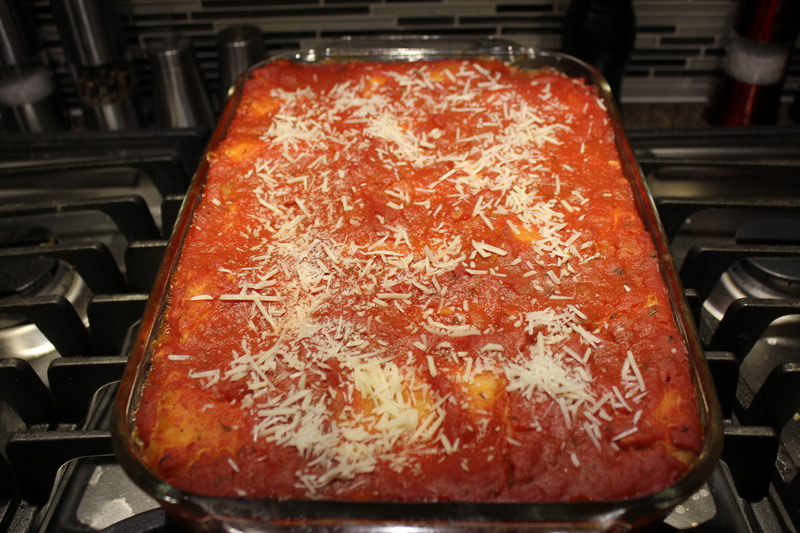 Preheat oven to 350 degrees F. Spread about 2 cups of the marinara sauce on the bottom of your greased lasagna pan. 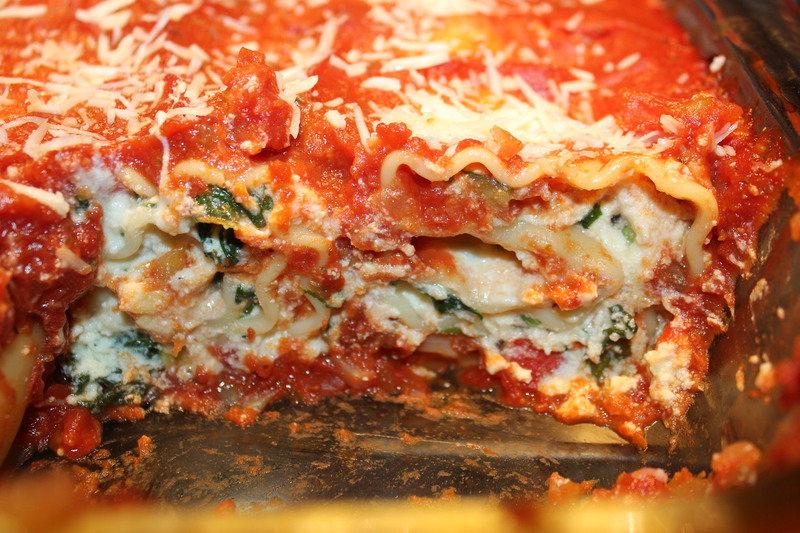 Take a cooled lasagna noodle, spread a thin layer of the cheese and veggie mixture the length of the noodle, and roll tightly. Place the roll-up seam side down on the marinara sauce. Repeat for the rest of the noodles. Top the roll-ups with the remaining marinara sauce. Bake uncovered for 40 minutes or so. 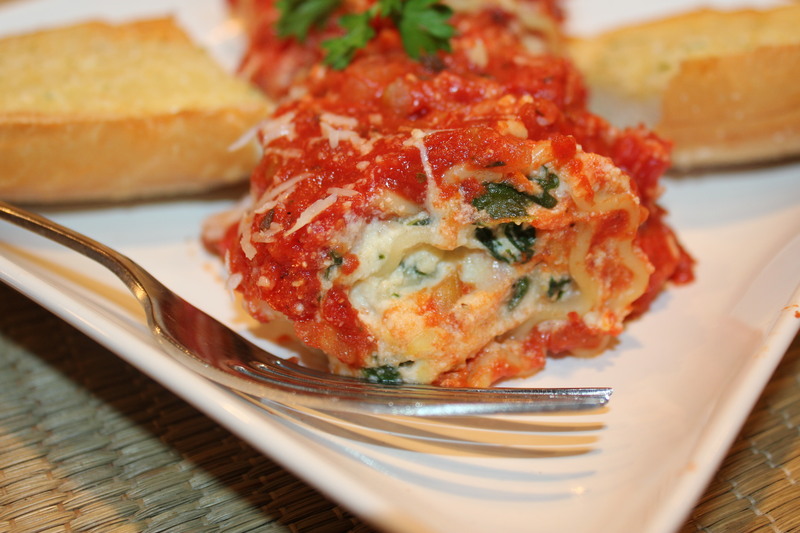 Sprinkle the top of the casserole with parmesan cheese, bake another 5 minutes or until the cheese has melted. Doesn’t that look awesome?! 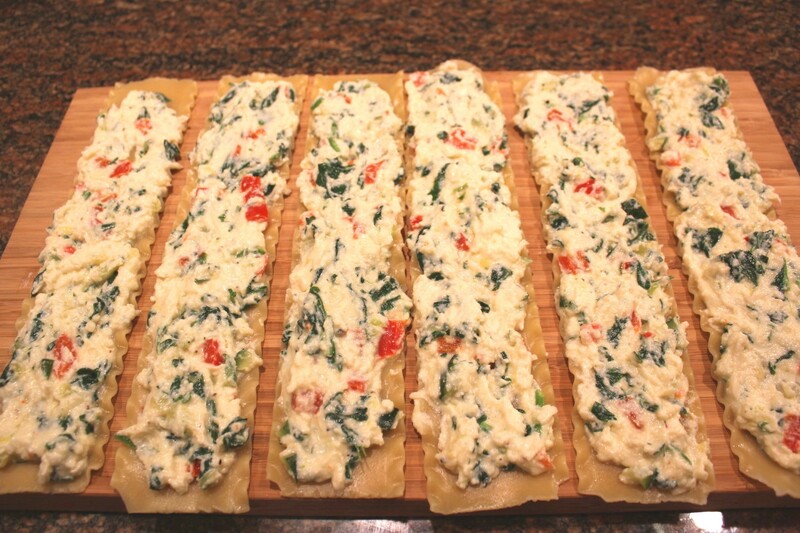 Serve with garlic bread and a nice glass of wine. 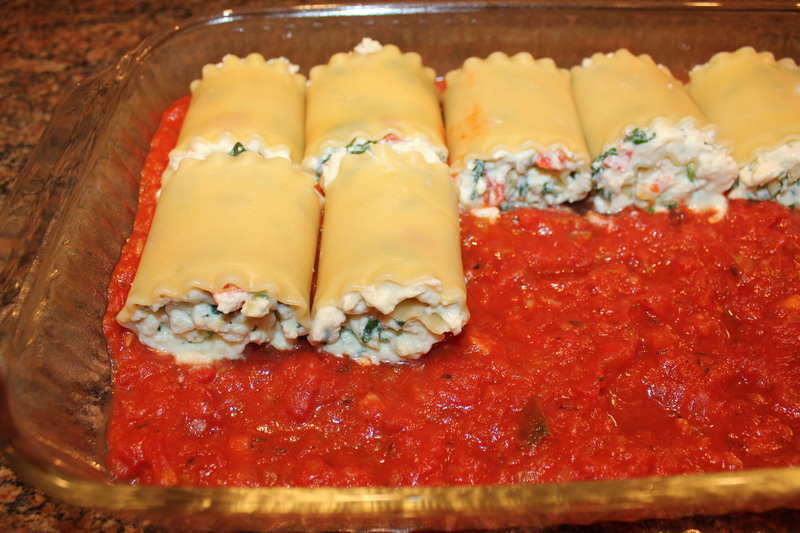 These lasagna roll-ups make great leftovers and keep well in the fridge for several days. 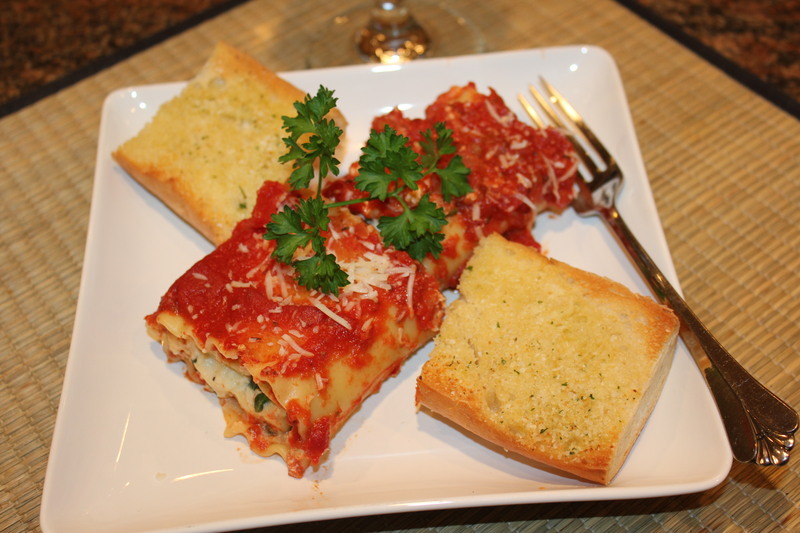 This entry was posted in Pasta, Rice, etc., Recipes, Vegetables/Vegetarian/Vegan and tagged Cheese and vegetable lasagna roll-ups, eat drink and be merry, Kelley Chisholm recipes, lasagna roll-ups cheese zucchini spinach, lasagna roll-ups recipe, Vegetable lasagna recipe, Vegetable lasagna roll-ups, vegetarian recipes. Bookmark the permalink. I plan to make these today. My filling will be a little different because I am using kale. My sauce was made yesterday. Yum. Thanks for sharing your recipe. The kale sounds interesting – I may try that next time. Thanks for the suggestion!